Melt the butter in a large frying pan and fry the bacon until crispy. Meanwhile, remove heads from sprats, if preferred, and clean large sprats. 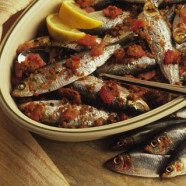 Add to the pan and cook for 3-5 minutes, stirring occasionally, until sprats are pale golden brown. Sprinkle over breadcrumbs and parsley and cook for a further 2-3 minutes, until breadcrumbs are crispy. Serve with a crisp green salad and brown bread and butter.